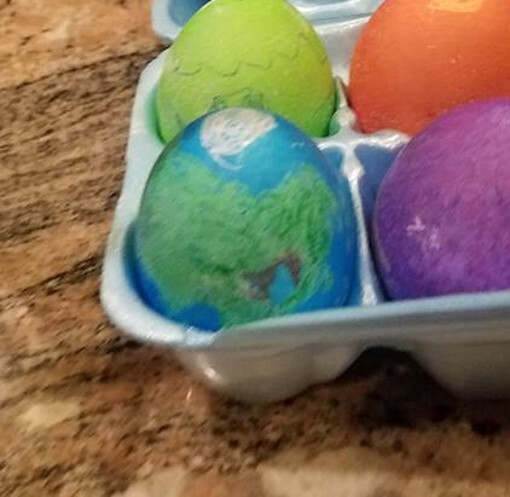 Among the dozens of Easter eggs that were decorated this past weekend, one of my talented progeny painted the planet. Very well, too. It was an instantly recognizable, if slightly pointy at the North and South Poles, miniature version of the Earth. This, of course, is not a bad metaphor on Earth Day. One could point out all sorts of appropriate comparisons about this planet’s fragility and the superficial (to it, if not to those of us who populate it) political and racial divisions we overlay on its surface. Feel free to come up with your own; I’m not going to belabor the point. All I really have the energy for is paying minimal attention to my own little portion of the planet. After a cold and bitter winter, the yard is looking ragged. Last year’s stalks still cover the flower beds. Scatters of gravel—collateral damage from shoveling the driveway—litter the grass. It all looks neglected and unkempt. But that’s not all. Tulips and daffodils are not blooming yet, but the plants are several inches tall and growing fast. Irregular spikes of bright green grass are prompting me to wonder whether the lawn mower will start. The buffalo grass is beginning to show a dignified soft green beneath last year’s dried curls. I saw two blooming dandelions yesterday. I suspect the thistles are limbering their muscles and polishing their brass knuckles, preparing for another season of bullying their way in where they aren’t wanted. 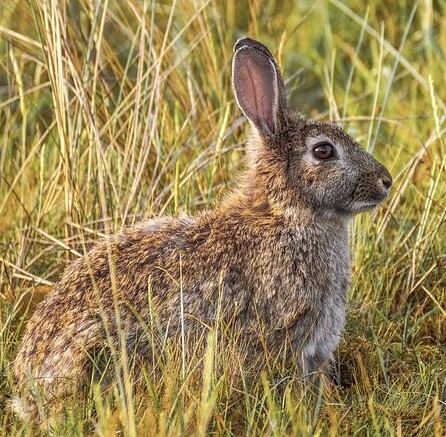 And in the warren under the bushes, where one stout cottontail rabbit spent the winter, now there are three. This morning, after yesterday’s rain, the outdoors smells like growing things and earthworms. Speaking of growing things, yesterday I got to help a couple of grandchildren color eggs. They took this task quite seriously, and we managed to accomplish it with minimal conflict and no spilled bowls of dye. When we were done, we had several hands full of blue and purple fingers, but there were no stains on the new shirt I unwisely wore, and the dog was the same color he was when we started. We enjoyed the process. We admired the finished eggs in all their colorful glory. Then, in the spirit of spring, resurrection, and Earth Day (reduce, reuse, recycle), we peeled several and ate them for lunch. Because a boiled egg, no matter how beautifully decorated, is still an egg. One of the skills in the “things I never particularly wanted to know” category that I’ve learned over this cold, snowy winter is the art of building fires in the wood-burning stove. Among the refinements I’ve figured out is that when you use old paper bags, tax returns, and bank statements for fire-starting, they ignite more readily if you first tear them into pieces. The other day, as I squatted in front of the stove solemnly tearing paper with utterly irrelevant precision into halves and quarters and eighths, I was reminded of my mother. Did I Sign Up For This? Even though so many of our New Year’s resolutions get tossed out the door before we even take down the Christmas lights, January is still a time of beginnings. Fresh starts. Clearing out of clutter. Reorganizing. Building new habits. Well, I’m doing all of that. And I hate it. My whole life needs to be reshaped, but not in a way I initiated or would have chosen. My beloved partner of 14 years was hospitalized in early October for a severe infection. After a series of complications that included dramatically severe reactions to medications and a high-risk surgery, in mid-November he died. So my reboot for this new year means adjusting my days around the huge empty space where he used to be. The man I woke up with, hiked with, enjoyed deep conversations with, and worked crossword puzzles with (I did names, puns, and references from classic fiction; he handled geography, science, and French. ), is gone. Gone too soon. This active, younger-than-his years man left so much unfinished. Research projects not completed, students not graduated, grandchildren not grown, trips not taken, and so many conversations and experiences not shared. He left behind memories, stories, sadness—and a whole house full of artifacts of his life. 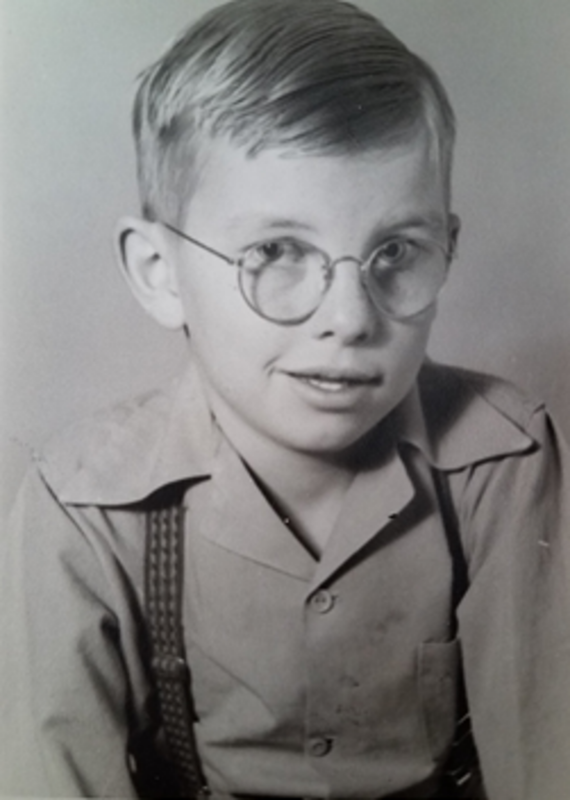 The long-ago photograph of an endearing little boy captures just one moment in a full life. Then, too, his painful last weeks were just one tiny segment of that life. The distance between the lovable child he was and the beloved wise elder he became was a long, rich path. I’m so grateful that I was able to walk part of that path with him. This new beginning of a new path that I’m coping with now is hard. I didn’t want this transition I’ve been handed. There are so many painful moments: I find the stub of a play we attended in the pocket of a coat he’ll never wear again. I pick up a page of unfinished research notes in his handwriting. I walk by myself on a trail where we held hands the last time I was there. It’s all hard. It all hurts. And it’s all a fair exchange. This difficult life change wasn’t really forced on me at all. I chose it, as one of the inevitable possible consequences of choosing to share life and love with someone else. No one made me take the risk to open my heart. I did it myself. I would do it again. The past 14 years of partnership, conversation, laughter, and love were worth it. For two or three months now, a green plastic bottle cap has been collecting dust in my car. Along with a few pennies and a couple of mints, it sits in the flat little compartment by the cup holder that is probably meant to hold parking-meter change. The cap is from a bottle of Sprite, I think. Since as an infrequent soda-sipper I don’t pay much attention to the finer points of bottle cap design, I’m not sure about this. Besides, I didn’t get this cap by personally emptying the bottle it came from. It’s in my car because it was a gift. 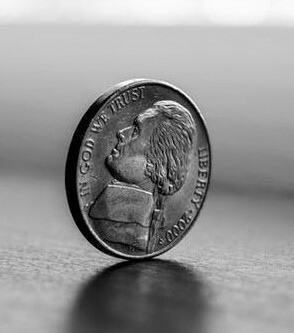 I received it from my five-year-old grandson when he taught me how to flip a bottle cap so he could defeat me in—er, challenge me to a cap-flipping contest. He demonstrated exactly how to tuck the end of your thumb under your curled forefinger, balance the cap on top, and flick up your thumb to send the cap into the air. It also would work with a coin, he explained. Turning 65. It’s not necessarily anyone’s favorite milestone birthday. So many things about getting older are annoying. Vanishing hair, for instance. Those silver ones are fine, even attractive if the light is just right; it’s all their friends and relations that have disappeared who are the problem. Or joints that start to creak when you move and stiffen up when you don’t. And skin that begins to look and feel somehow too big for you. The family has all been banished from my workspace. No more eyes on my computer screen to know when I’m working and when I’m playing online Scrabble. No more distracting smiles in my direction while I’m sitting in my comfy chair with my pen and notebook. No more hanging around in my office. The only one left is a single grandchild. For the sake of family harmony, let me hurry to add that this isn’t due to his particular place in my heart. It’s due to his particular place in my office. He’s on the inside wall. The others, on the outside wall and just around the corner from it, had to go. But truly, it was for their own protection. The siding crew starts work on our house tomorrow, and we certainly don’t want family members bouncing off the walls when the thumping starts. This, of course, is the poem inscribed on a plaque at the base of the Statue of Liberty. It is a stirring, moving testament to the ideal of and belief in the United States as a haven for newcomers. The last few lines are quoted frequently; they come up in almost any discussion of immigration. Yet today, terrorism and wars and natural disasters are creating not only a crisis of refugees, but also a climate of fear. 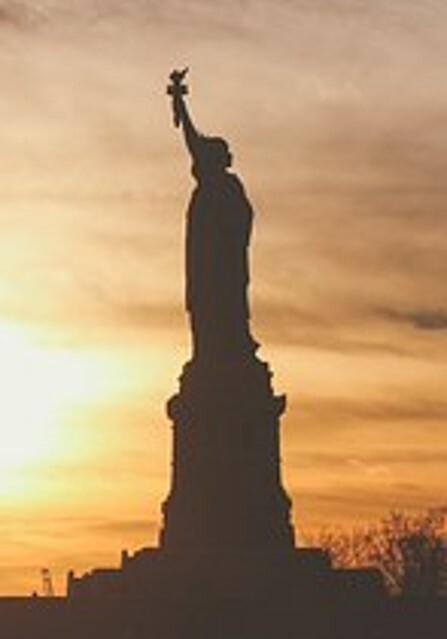 In that climate, some Americans seem to think Lady Liberty ought to lay down her “torch of world-wide welcome” in favor of laying bricks to build a wall. In that climate, I’m not sure that glibly repeating Emma Lazarus’s words is all that helpful. I don’t know whether my grandson Henry, at age five, can quote Yoda’s advice to Luke Skywalker from The Empire Strikes Back. Chances are he can. I assume this because long, long ago, in a theatre far, far away, I remember watching Henry’s father watching the original Star Wars movie when he was about a year younger than Henry is now. He didn’t fidget; he didn’t talk; he didn’t get drowsy even though he had just finished a huge Thanksgiving dinner. He sat enraptured through the whole film, meanwhile munching his way steadily through a big bag of popcorn that he should not possibly have had room for. Here and now, in this galaxy, Star Wars has come around again. This means a whole new universe of toy light sabers, action figures, and other galactic merchandise. Even by the standards of an early-morning person like me, 8:30 p.m. isn’t really late. But in the short days of late November, when you’ve just staggered off of an airplane at the end of a day that started 20 hours earlier on a different continent, 8:30 p.m. can feel like the deep, dark middle of a very long night. But the plane landed promptly, my friends were at the airport to pick me up, and when we turned from the dark street into the dark driveway of what I expected to be our dark house—there was light. My daughter had stopped by to turn up the thermostat, and she had left the porch light on for me. Plus the light inside the entryway, plus a lamp shining warmly through the front window. The impact of this simple gesture went far beyond the practical kindness of making it easier to lug my bag up the steps and unlock the door. The light allowed me to walk into a warm, bright haven instead of a cold, dark house. It made me feel safe and welcomed me home.